NHS plans to recycle the contents of the 21 outdoor recycling bins every Wednesday and Saturday. Prior to this program, items placed in the outdoor bins were not taken to the recycling dumpster but were disposed of as trash. Photo by Akshay Agrawal. Items placed in the tan outdoor recycling bins are not actually recycled — they are usually trashed, according to Dean of Students Michael Hicks. But starting Nov. 12, National Honor Society will recycle the contents of the outdoor bins on Wednesdays and Saturdays. Until now, no structured program had existed on campus to recycle the contents of the outdoor receptacles. Infrastructural deficiencies were partially responsible for the lack of recycling. According Hicks, the 20 or so blue recycling bins once located on campus were often moved around, and approximately 16 disappeared altogether. In order to equip MVHS for a recycling program, the nomadic blue bins were replaced with their permanent tan counterparts during the last school year. Even with the bins in place, items disposed of in the outdoor recycling bins were not emptied in the appropriate dumpster near the D building staff parking lot; Hicks stated that the school lacks sufficient custodial staff to do so. The contents of the indoor recycling bins, however, are recycled — the bins are emptied by members of Perspectives, a hands-on learning program for special education students. 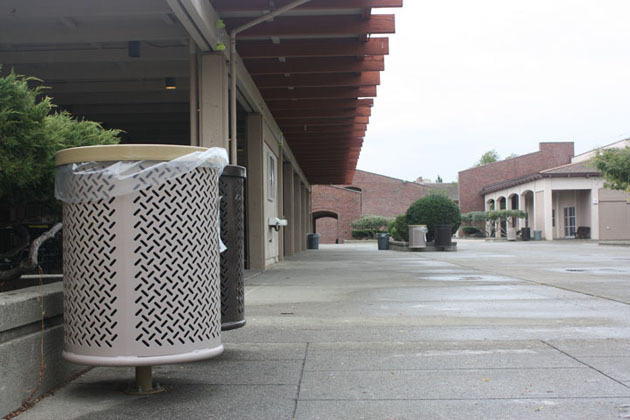 During the previous school year, Club Commission attempted to arrange for certain clubs to voluntarily empty the outdoor bins on a semiweekly basis, but the program failed to materialize. NHS president senior Craig Boman volunteered his club to undertake the initiative towards the end of the school year, although the logistics of the program were not finalized until recently. “All that matters is that we’re getting started. It’s a big step,” Boman said. In exchange for volunteering hours, NHS members will empty the 21 bins every Wednesday and Saturday for the remainder of the school year. According to Hicks, administration does not currently plan to expand the program beyond NHS because of the communication issues that involving multiple clubs might entail. “I think right now, less is more,” Hicks said. Club commission plans to complement NHS’ efforts by spreading awareness about the recycling program; Leadership students will visit fifth period classes during the week of Nov. 14 and inform students about recycling guidelines. The commission also aims to produce a promotional video and distribute informational fliers by the end of November. The 21 recycling bins that NHS will empty on a semiweekly basis are represented with numbered circles. Document provided by Craig Boman.